During a recent performance in New York, Sting told the story of how, in his shipbuilding hometown of Wallsend, northern England, when a particularly large vessel was finished, the queen would sometimes visit for the christening. On one such occasion, Sting, then a young boy, standing on the side of the road, caught her eye, and she waved to him from her royal limousine. And that, he says, was when he decided: "I didn't want to be on that street. I didn't want to end up working in that shipyard. I wanted to be in that limousine!" Sting has had many spectacular rides since then, of course. He is among the most famous musicians in the entire world. But as fate would have it, after a long creative drought, even he had to return home, back to the gritty shipyards, to find his muse. By 2010, there was little Sting hadn't accomplished as a musician. He'd won 17 Grammys, been inducted into the Rock and Roll Hall of Fame, had sold in excess of 100 million albums and, in recent years, had channeled his creative energies largely toward esoteric projects, such as recording an album of the music of English Renaissance composer John Dowland, another of 14th century carols, and another of symphonic versions of his pop songs. He had also, over the years, acted in films, established himself as an admirably energetic and generous philanthropist and written a widely acclaimed autobiography. In 2007, he even teamed up with his former band, The Police, for one of the biggest reunion tours of this era, celebrating the 30th anniversary of their founding with a yearlong jaunt that took them everywhere from Vancouver to Macau, and which, by the time it ended, was the third most successful tour in rock-music history. What Sting hadn't done much of lately was songwriting. "I went through a long period of not writing songs," he says, looking about half his age of 62, relaxing in a suite at the Park Hyatt Chicago the day after an arena concert in Detroit with Paul Simon. "I'd gone almost eight years with very little to show. You know, I make my living as a songwriter. My career, my whole life, was based on that. So I began to sort of wonder why, ask myself questions… 'Why have you guys abandoned me? What have I done?' And, just as a sort of therapy, I started to go back to my roots, and think about writing… but instead of about me, about the people I grew up with, the community I was brought up in." For most people, the Sting story begins in 1977, with the formation of The Police, who quickly shot to worldwide megasuccess, releasing several hugely popular albums before calling it a day after conquering, a la The Beatles, Shea Stadium in 1983. But, as those who've read his excellent 2005 autobiography, Broken Music: A Memoir (Dial Press), know, his formative years as a boy, school teacher and struggling artist in the hardscrabble shipbuilding town of Wallsend, near Newcastle, deeply impacted not only his development as a musician, but also his general ambitions. It was Wallsend, and its people, that inspired Sting to embark on his latest project, the musical The Last Ship, which debuts at the Bank of America Theatre on June 10 for a monthlong run before heading to Broadway's Neil Simon Theatre this fall. "I was born in the shadow of a shipyard," Sting says. "The people in the street worked in the shipyard. It's something I escaped. That was the last place I wanted to work. But going back there and deciding to sidestep my ego and write about those other people opened this channel up, and I began writing very quickly. All kinds of characters emerged - situations, voices. Whole songs came out of me as if they'd been locked up inside for a long time. And I realized what was materializing was a three-dimensional drama." 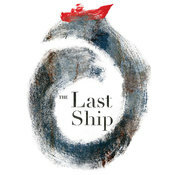 That type of piece requires other players, and as it grew, The Last Ship acquired a top-tier crew: The book was written by Tony Award winner John Logan (Red) and Pulitzer Prize-winner Brian Yorkey (Next to Normal), and is directed by two-time Tony Award-winner and Rockford native Joe Mantello (Wicked). The story promises to be particularly relatable to those in cities that have been hit hard by industrial decline. The play follows Gideon Fletcher, a Sting-ish young man from Wallsend, who leaves to travel the world, returning 14 years later, in the '80s, to discover not only that the shipyard in the largely one-industry town is on its last legs, but that his childhood love is engaged. In a desperate gesture, despondent workers seize the factory and begin building their dream ship. Themes of love lost, economic strife and friction between fathers and sons permeate the show. The music itself has been available since last September, when Sting released the record The Last Ship (CherryTree/A&M), from which the vast majority of the show's numbers are drawn. While the folk-inspired tunes are performed by Sting on the record, he will not be appearing onstage; rather, the characters will be portrayed by a cast of acclaimed Broadway vets. "I took the idea to a Broadway producer, and I said, 'What do you think?'" says Sting. "He said he loved it. He said, 'This is about community, and it's a community under siege. We'll get to know these people and care about them, and then we'll see how they react to the situation.' It's a universal situation that people will understand in Chicago, Detroit and Newcastle." The subject certainly resonated with acclaimed musician and actor Jimmy Nail, of British series Auf Wiedersehen, Pet fame. An old friend of Sting's from Newcastle, he came out of retirement to play the character of Jackie, a shipyard foreman. "It's about resilience in the face of great adversity," says Nail. "There was mining; there was shipbuilding; there was a lot of engineering; a lot of construction; and it's pretty much all gone. There's no opportunity to do physical craft. The idea of being a journeyman, an artisan - it's gone. There was employment. There isn't now." While this was Sting's first crack at writing a musical, he actually got his start as a paid musician in Newcastle playing bass in the orchestra pit of productions such as Joseph and the Amazing Technicolor Dreamcoat. Whether those tunes took stronger hold than one might have guessed, or he's a wildly quick study, after listening to the record, it's hard to deny that Sting's sprawlingly lyrical, hugely melodic compositions feel like a Broadway composer's work. "He's found a way to keep his own voice," Mantello says. "When you listen to the score you know that Sting is the composer and the lyricist, but the songs are very theatrical, and that's a hard balance when you're coming from another world. I think somehow he understood it innately." Sting, of course, was enamored of the challenge of mastering yet another musical genre. "I'm here to learn; I'm here to learn," he says, not quite convincingly. "I think the form - the musical theater form - is one that works, and you have to respect it. I'm not here as an iconoclast to break it down. So you have to respect the form, but at the same time challenge it. It's not the same as writing for a pop album because you have to advance a narrative. The character has to be telling a story while he's singing.It's not an obvious thing to do as a songwriter." What was obvious, to a degree, was the decision to draw inspiration for the compositions from the northern English folk canon. "The local music of the region is very rich," he says. "It's the old Kingdom of Northumberland; there's a distinct folk music there, which was heavily influenced by the massive Irish and Scots immigration in the 19th century, so there's lots of Celtic influence. But [in the score] there's also a tip of the hat to musical theater - chromaticism, the odd augmented chord, which I nicked off Rodgers and Hammerstein. So it's a blend of those things, but it is built on the music of the region." Sting has said that he very well may never write an introspective pop song again. It's unclear where his restless creative drive will take him next. It could even be more theater but, if that's the case, it's unlikely that any future projects will be as close to his heart as The Last Ship. "There's no more important story for me to tell," he says. "And this may be it. This may be all I ever do in this field. And I need to tell this story. I think that's what I was waiting for all these fallow years, to have the courage to do it. And it feels good."